It is often said that “Washington is broken.” But this widely held belief reflects a common misunderstanding of the problem. In fact, Washington is delivering exactly what it is currently designed to deliver. * The real problem is that our political system is no longer designed to serve the public interest. Rather, with little public awareness or oversight, the system has been slowly reconfigured to benefit the private interests of gain-seeking organizations—our major political parties and their industry allies. There’s just one problem. 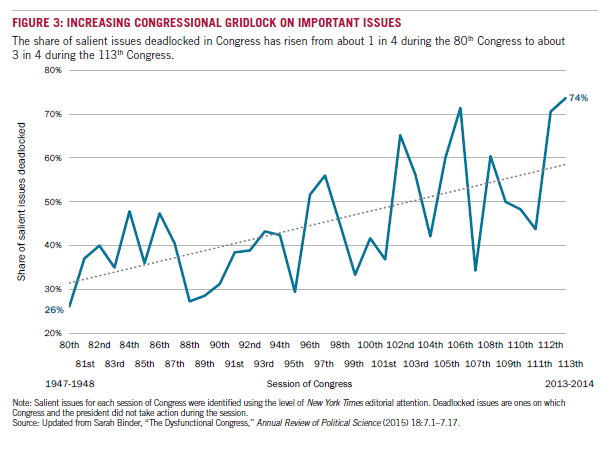 The people whom the politics industry is supposed to serve have never been more dissatisfied. 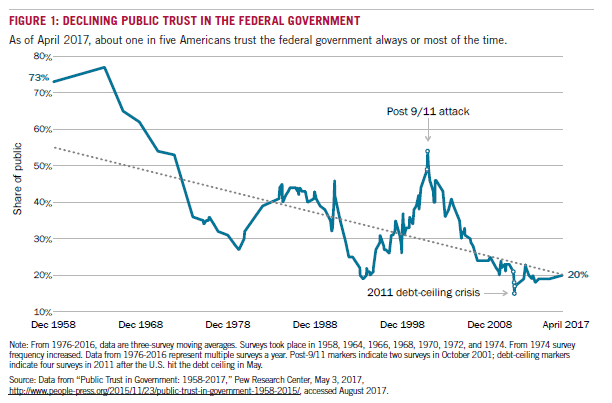 Public trust in the federal government is hovering at a near 60-year low (see Figure 1). In 1958, three out of four Americans trusted the government. In 2017, this had fallen to one in five. There are many other signs of citizen dissatisfaction and disillusionment (see Appendix A). interests of all citizens and finding common ground to move the country forward. It wasn’t always that way. America’s political system was long the envy of the world. It advanced the public interest and gave rise to a grand history of policy innovations that fostered both economic and social progress. Today, however, our political system has become the major barrier to solving nearly every important challenge our nation needs to address. This was the unexpected conclusion of the multiyear Project on U.S. Competitiveness at Harvard Business School, established in 2011 to understand the causes of America’s weak economic performance and rising inequality that predated the Great Recession. 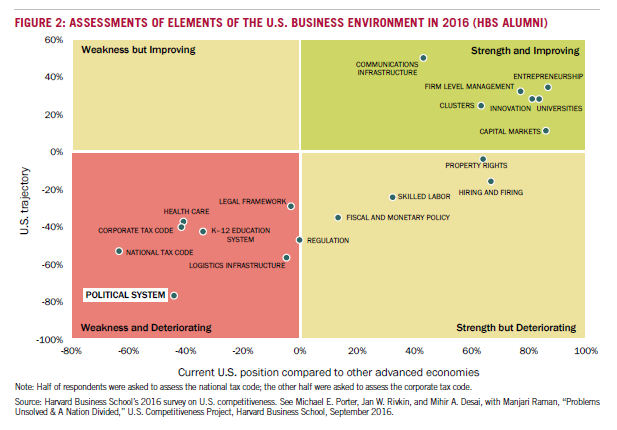 As shown in Figure 2, the research revealed that the U.S. business environment has seriously eroded, especially in those areas that are primarily the responsibility of government, while other nations have progressed. Simpson-Bowles, an effort to create a sustainable federal budget, provides a telling example of the failure to deliver solutions. A substantial majority of Americans agree that our unsustainable federal debt and deficits must be addressed.2 In 2010, President Obama established the National Commission on Fiscal Responsibility and Reform—most often referred to by the last names of its co-chairs, Alan Simpson and Erskine Bowles. The Simpson-Bowles report provided an actual, comprehensive solution. Why did it go nowhere? While there was bipartisan support from numerous legislators, this wasn’t enough. In practice, neither party was willing to go against its party orthodoxy, or to give up or even compromise on any of its special interests. Instead, Simpson-Bowles died a bipartisan death. Representative Paul Ryan, who served on the Commission, voted against it. President Obama, who created the Commission, declined to forcefully support it. No other legislators jumped in to save it (though some from both parties were courageous enough to voice public support). 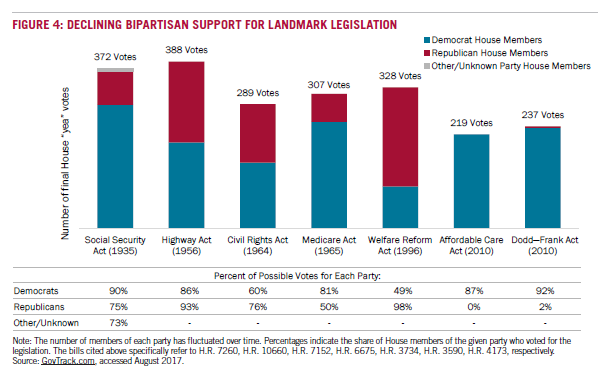 Most legislators were unwilling to go against their party line and risk a primary challenge from their right or their left.